Theresa May has been accused of “overseeing the demolition of the devolution settlement” by the SNP. Ian Blackford made the claim as he urged the Prime Minister to renew efforts to seek agreement with the devolved governments on the treatment of devolved powers in Brexit legislation. Mrs May said the Scottish and Welsh administrations would be handed “significant” new powers after Britain leaves the European Union. 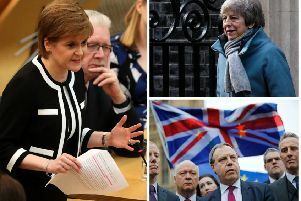 Whitehall, Holyrood and Cardiff Bay are deadlocked over how to handle the repatriation of responsibilities from Brussels, with the devolved administrations accusing Theresa May’s Government of a “power grab”. The UK Government has said it will table amendments to Clause 11 of the European Union (Withdrawal) Bill without the agreement of the governments in Scotland and Wales. “The Prime Minister famously claimed that the UK was made up of equal partners,” said Mr Blackford, the SNP leader at Westminster. “What an irony, now that she’s overseeing the demolition of the devolution settlement. “In 1997, the Tories were happy to oppose the re-establishment of the Scottish Parliament. “Their clothes haven’t changed. Now in 2018, they’re happy to systemically destroy the settlement that the Parliament thrives on. Speaking at Prime Minister’s Questions, Mrs May said: “This is a Government that has actually given more powers to the Scottish Government. “This is a Government that will be giving more powers to the Scottish Government, significant extra powers will be devolved to the Scottish and Welsh governments as a result of the decisions that we’re taking around Brexit. “But we have given more powers, including of course the tax raising powers. Earlier, Mr Blackford said the devolved administrations had been waiting for the changes for months. “On Monday, these long awaited amendments were published, but without the agreement of the devolved governments,” he said. Mrs May replied: “In one sentence he says he’s waiting for this amendment, and the reason that we were taking time was because we were talking with the Scottish government and the Welsh government. Mr Blackford said the question was about agreement from the devolved governments “and that answer simply wasn’t good enough”.